This week’s SavingStar Healthy Offer is to Save 20% on any single purchase of loose Asparagus at participating retailers. This offer expires 3/24/2014. If you are looking for a new way to serve up asparagus to your family, Knorr has a great Lemon Chicken Primavera recipe. I have made this several times. It is quick, easy and tasty. Melt 2 tablespoons Spreadable Butter in 12-inch nonstick skillet over medium-high heat and brown chicken, turning once, about 5 minutes. Remove chicken from skillet and set aside. Melt remaining 1 tablespoon Spreadable Butter in same skillet over medium heat and cook shallots, stirring occasionally, until tender, about 4 minutes. Stir in water and Knorr® Homestyle Stock - Chicken until Stock is melted. Bring to a boil over high heat, stirring frequently. Add asparagus and return chicken to skillet. Reduce heat to low and simmer until chicken is thoroughly cooked and asparagus is tender, about 3 minutes. Stir in lemon juice and serve, if desired, with hot cooked rice. *TIP: Try using green beans, broccoli florets, green peas or sliced mushrooms instead of asparagus! 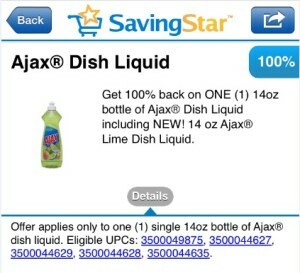 If you are using SavingStar, be sure to add the latest offer for 100% Back on ONE bottle of Ajax Dish Liquid. Offer expires 1/26/2014. Be sure to check the UPC before you make your purchase. If you are shopping for some healthy food this weekend, be sure to check out the SavingStar offer for 20% savings on Broccoli. 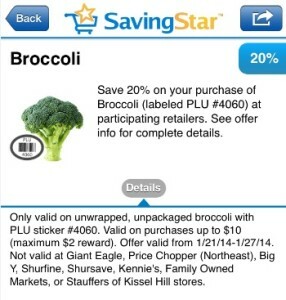 Some restrictions apply: Only valid on unwrapped, unpackaged broccoli with PLU sticker #4060. Offer valid through 1/27/14. Keep in mind, the SavingStar savings do not come off at the register, but are added to your SavingStar account. Once you reach $5 in your account, you can cash out. If your family loves bananas, be sure to check out the SavingStar for 20% savings. 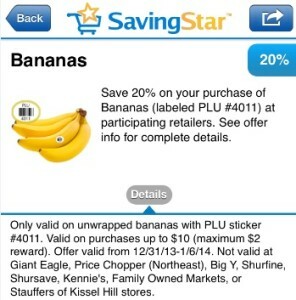 Purchase bananas (labeled PLU #4011) at a participating retailer and get 20% added to your SavingStar account. This particular offer is not valid at: Giant Eagle, Price Chopper (Northeast), Big Y, Shurfine, Shursave, Kennie’s, Family Owned Markets, or Stauffers of Kissel Hill. Remember, SavingStar offers do not come off at the register. Instead, they are added to your SavingStar account. When you reach $5 in savings you can then choose a bank deposit, PayPal deposit, Amazon Gift Certificate, or a donation to the American Forests orgainzation. I’ve mentioned Receipt Hog in the past, if you were interested, but use an Android device they now have an app for you! 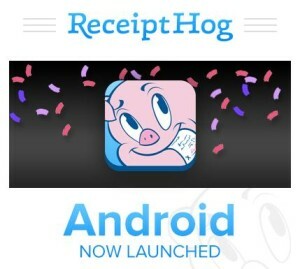 Receipt Hog is now available in the Google Play Store as well as the App Store. If you missed my previous posts and are wondering what Receipt Hog is….it is an app that you can use to take pictures of your grocery receipts. You upload those receipts, and once they are processed, you earn coins. You can cash out for cash via PayPal, or Amazon gift cards. SavingStar is currently running an offer on All Nestle Frozen Food Products where you get $5 when you spend $30. This pairs well with a sale on Lean Cuisine coming up at Fry’s. 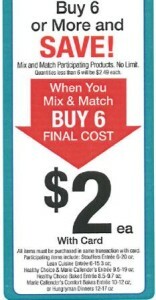 Starting Wednesday, 7/10, Fry’s has a Buy 6 or More Save sale on Lean Cuisine. Buy 6 or more and the final price is $2. The Nestle Frozen Food offer is a One or Many deal, meaning you do not have to spend $30 in one transaction. You can have multiple transaction, as long as they occur before the offer expires on 7/31. If you are not familiar with SavingStar, it is digital coupon program. The savings does not come off at the register, instead it is put into your SavingStar account. Once your account reaches $5, you can cash out. I highly recommend signing up for SavingStar! It’s pretty simple, just sign up, associate your grocery and drug store loyalty cards with your account, and pick the eCoupons that interest you. Keep in mind, the SavingStar eCoupons don’t come off at the register. They are applied to your account. Once your account balance reaches $5 you can cash out. They have an iPhone app and an Android app available. I have shared information on various apps that help save or earn a little extra money. I recently found a new one…at least it is new to me. ReceiptHog is an app for iPhone users. Rumor is they are working on an Andriod version as well. They have other ways to earn coins as well. This morning I had a brief (5 questions) survey related to one of my purchases. I earned 10 coins for completing it. You need a minimum of 1000 coins to cash out for a reward. Right now rewards are cash via PayPal or Amazon gift cards. 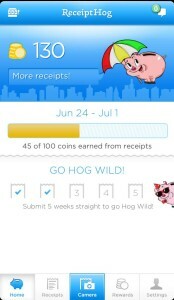 If you are interested in trying it: Get Receipt Hog! I’m giving it a try…it doesn’t take long to take pictures of a receipt, and given enough time and patience, I will earn some cash! They have a FAQ section if you still have questions on how it works. Have you heard about Target’s newest way to save? It’s called Cartwheel. Signing up is easy, you will need to use your Facebook account. You will be able to set your sharing level. Once you sign up, you are allotted 10 spots for saving offers. Once you redeem your first offer, you are given an 11th spot. Right now there are over 650 offers to choose from, so you probably won’t have a problem finding at least a few offers to help you save. Offers range from 5% to 20% off the purchase price. 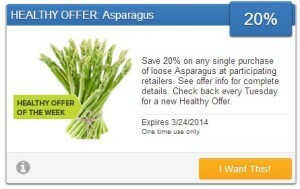 The even better news…you can still use Target coupons and manufacturer coupons along with your Cartwheel savings. Once you select your offers, you can either go to “my Cartwheel” and choosing “redeem in store.” This will give you a printout with a barcode for the cashier to scan. You can also access the “my Cartwheel list” on you phone. Each offer can be used on up to 4 items. They have offers in just about any category you can think of: baby, electronics, grocery, household essentials, health and beauty, kids, home, and the list goes on. 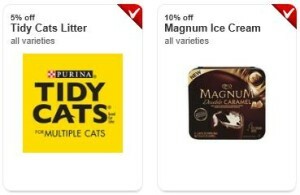 If I had noticed the 5% Off Tidy Cats Litter, prior to going to the store, I would have been able to do even better on my kitty litter purchase! 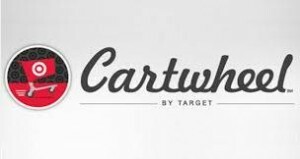 Check out Target’s Cartwheel FAQ section if you have any additional questions. This is new, and even some of the cashiers are not all that familiar with it. My husband and I both love to read, and we are trying to make sure our children love books just as much as we do. However, buying new books can be expensive. When we decided that I would stay at home, one of my goals was to get us the things we enjoy without breaking the bank. My husband looked through his bookshelves and found a stack of books that he no longer wanted. This is when I found Paperback Swap. After you have Posted the first 10 books to your bookshelf, you get 2 “startup” credits from PBS to get you started swapping. After that, you earn credits by sending out books to others. Only the first account for a household receives startup credits. You may order any available book for 1 credit each (paperback/hardcover). audio books cost 2 credits each. Wrap and mail your book. When the requester receives it, you earn 1 credit (2 if it is an audio book). Yes, you pay the postage to send out your books, but when you request a book, the sender ships it to you free of charge! The books you receive from PBS are yours. We hope that you will repost them to share with other members when you have read them, but you can certainly keep them, or give them away. Similarly, the books you send out to others belong to their new owners. I just found out today that you can transfer credit between your own Paperback Swap, SwapaCD, and SwapaDVD accounts. SwapaCD and SwapaDVD work the same as Paperback Swap.